We can not tell you the secrets, but we can challenge you to travel through time to discover the origin of the conventual pastry, the essence of the egg cream, the customs shared by the Cistercian monks and nuns, until they reveal all the details hidden in the convents. An art that originated in Portugal in the fifteenth century. A scenario that fits perfectly in kitchens, ovens or even counters decorated with yellow-brown which hosts the XIII International exhibition of Conventual Pastry and liqueurs. This event has already received an Honorable Mention of the Portuguese Tourism Prize 2010, for the category of Best Event, during the International Tourism Fair (BTL). 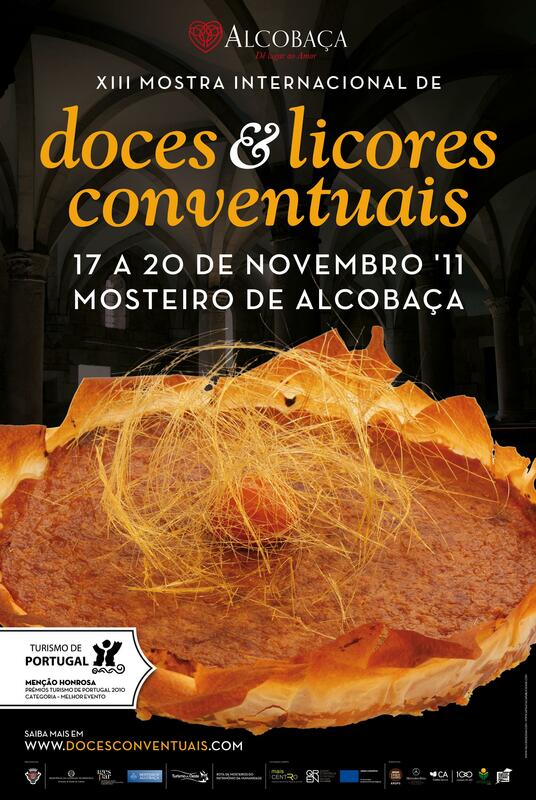 To our visitors, we only wish you to have fun in this one and only place [Monastery of Santa Maria de Alcobaça, and Wonder of the World Heritage of Portugal] which reunites the widest range of conventual products with national and international representation of Portugal. This event, which hosts over 40 national and international participants, will be attended by representatives from Portuguese convents, monasteries of Spain, Abbeys of France, Belgium and Brazil. Sugar becomes, once again, the most charismatic mark of the best convent exhibition of the country, where over 35,000 visitors are expected. Welcome to the capital of conventual sweets.